Our MBA 2019 Vendor Guide offers information on sponsor, exhibitor, advertising and membership opportunities with the Mississippi Bankers Association throughout 2019. Each section contains downloadable PDF files with information and forms to submit. Each section contains downloadable PDF files with information and forms to submit. As an MBA event sponsor, you will be recognized as a supporter of Mississippi's banks and bankers, and, at the same time, you will have a unique opportunity to promote your business. Sponsors of particular events or activities are accepted on a first-come, first-served basis, subject to preferences given to (1) those who sponsored the event or activity the previous year, (2) MBA members and MBA Affiliates, and (3) full sponsors (who receive priority over partial sponsors). Exhibitor events provide vendors with the opportunity to directly market their products and services to bankers participating in MBA events. Our MBA Trade Show, MYB Convention Exhibitor Functions, and other exhibitor events highlight and promote exhibitors and their materials, providing maximum exposure for each team and message. Current MBA Affiliate members are eligible to become Program Partners. Not an Affiliate member? Not a Program Partner? Download our membership information and find out how you can support the Mississippi Bankers Association and market your business and products to Mississippi bankers around the state. Questions or ideas? Need more information? 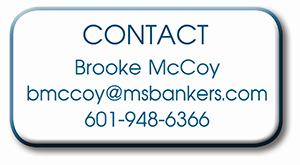 Please contact Brooke McCoy, Marketing Manager, bmccoy@msbankers.com, or 601-948-6366. We thank you for your support of the Mississippi Bankers Association and look forward to your company being involved!